Bali is a picturesque island off mainland Indonesia and is the region's premier getaway destination. Synonymous with style, entertainment and fun, Bali is paradise for most of the holidaymakers which flock to the isaldn. Despite its international popularity, it is still possible to venture away from the crowd and find quieter getaways in Bali, such as the island of Lembongan off the coast of the Klungkung, or the beaches of Jembrana. We also have a full city guide for Jakarta, Indonesia. Denpasar is the capital of Bali, however, after arriving at Denpasar International Airport, many tourist bypass this bustling city completely in their single-minded search for the coast. Apart from its golden beaches and ancient temples, Denpasar is also the site of much of the islands local history. It has a museum which displays art and artefacts, from ancient to contemporary times, as well as several historical sites including the Werdhi Budaya Art Center, Catur Muka Statue, and the infamous Puputan Square. Puputan Square was built in memory of the 1906 â€˜Puputanâ€™ (or â€˜fight to the deathâ€™) against the Dutch rulers, where countless of Balinese men, women and children died and much of the nobility was wiped out in a protest-driven attack against the advancing Dutch forces. Bulelend is stretched along the north coast of Bali, from the western-most tip across the central northern coast. Apart from tourism, Bueleng also has a developing economy in agriculture and traditional crafts such as silver craftin, batik and woodcarving. The town of Gilimanuk connects Bali with neighbourijg Java, and passengers can catch a ferry from here across to Ketapang, Java. There are very few tourist sites in the region hence this area is less popular than other regions of Bali, such as Kuta, and is a good place to head if you are hoping to get away from the crowds. Much of the beaches here are black volcanic sand due to the volcanoes located in the north of the region, however there are some white coral beaches at Gilimanuk and Medewi. In addition, the West Bali National Park in the west (crossing over into Buleleng) is home to much of Baliâ€™s species of flora and fauna. 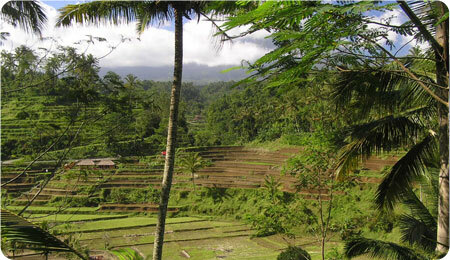 Karangasem is perched on the eastern tip of Bali and is one of the larger regencies, occupying just under 840kmÂ². Along the coast one can view incredible terraced rice paddies, a sight which is not to be missed. Many of the beaches in this area have black sand due to the volcanoes found inland. This area has over 117 traditional villages, subdivided into almost 300 smaller community groups. Agriculture is a priority in northern and central Badung, and tourism features more in the south. 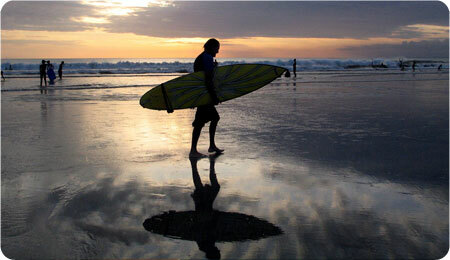 Kuta, the most popular resort in Bali, is located in southern Badung. While Tabanan is not as much of a tourist destination as Badung, it does have one of Baliâ€™s most popular tourist sites; Tanah Lot, an ancient temple built over the sea. The district is divided into two areas; the lower plains and the mountains further inland. In the mountainous area there is much to do, from jungle treks and canoeing on the lakes to visiting the hot springs. The climate here can also be quite cold at night, making fireplaces a necessity in many hotel rooms. It has also made the cultivation of fruits such as strawberries possible. 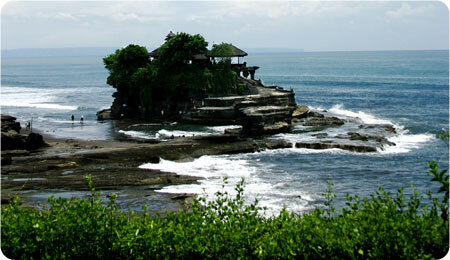 Klungkung is the smallest district of Bali, although it does also include three small islands. The main town, also called Klungkung, has several magnificent buildings which display architecture and decoration typical of the region. Klungkungâ€™s three islands; Nusa Penida, Nusa Lembongan, and Nusa Ceningan, are all accessible via ferry from the coastal village of Kusamba. Nusa Lembongan is the most populated of the three and offers several places to stay as well as crystal clear waters for diving and snorkelling. Lacking the big hotel complexes and tourist facilities of mainland resorts such as Kuta, Lembongan island is a great place to go to get away from the crowds and experience beachside Bali as it was years ago. Gianyar has a landscape rich with lush mountains, beautiful coastline and ancient temples. 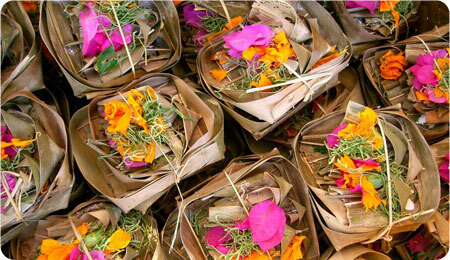 Locals make a living from hand crafts using materials such as silver, palm leaf and bone. Bangli is the only regency which is completely landlocked, however this lack of ocean is made up by the regionâ€™s stunning natural scenery, including Mount Batur and Lake Batur. Mount Batur is an active volcano - it is possible to trek to the summit however extra caution should be taken due to the lack of facilities and safety rails. Lake Batur is located in one of the crater of the volcano, and is the largest lake in Bali. As such, it plays an important part in providing irrigation to the islandâ€™s rice paddies. It is revered by the locals and has a magnificent temple perched elegantly on its shore.